Even if there is a connection between information and communication technology (ICT) and growth in the European economy has been understood, specific policy measures describing how ICT can power growth are often too generic. While much of the debate has zoomed in on the level of digital investments, this policy brief offers a framework for considering more tailored policy recommendations. Countries need to focus on exploiting their comparative advantages in the data economy and everyone cannot be a leader in the endowment of data. Policy attention is also needed for so-called intermediating policy factors that can improve economic performance through ICT in non-digital sectors. Increasing a country’s digital investment is one thing, but much of the factors that will have a real impact on the link between ICT capital and economic growth is country-specific and requires careful analysis and tailored policy reforms. Digital investment and the use of data are increasingly important to the health of the economy. It is beyond doubt that many business models of European firms critically depend on the use of digital trade and cross-border data transfers. It has also become clear that consumers across Europe are benefitting more and more from the use of the internet. However, not all countries tap into the digital economic opportunities that lie in front of them and there are several barriers preventing individuals, firms and entire economies from reaping the potential gains. Nor do all economies unite in the prospects for what type of growth that could follow on greater data investment and for those countries that want to raise the economic impact of data, it is important to understand their potential and the tailored policy conclusions that follow from it. In other words, there has to be a coherent policy framework for policy makers. This brief tries to do that. It connects several recent papers that have addressed the issue of digital investments and extends discussion on their issues covered, which are data, software investments, how it can induce economic growth within the EU, and what kind of policy reforms are subsequently needed. In all of these previous works, the connection is made between the use of Information and Communication Technology (ICT) and its effect on economic performance. First, Hofheinz and Mandel (2015) show that investments in so-called “intangibles” are correlated with the production and use of data within an economy. Intangibles are investments made by firms in, for instance, research and development (R&D), computerized information, product development or training, and branding. This link between intangibles and data is important as it generates new sources of economic growth. This happens in part because these new types of investments had not been properly accounted for by economists in the past and have become increasingly important for firm revenues and earnings. Second, in a previous paper, I have gone a step further and showed what policy measures should be considered in order for ICT to improve economic performance. More specifically, I have analyzed which specific policy measures are needed for economic growth to happen with the use of one type of intangible investment that is related to ICT, namely computerized information (i.e. software). Much ICT investments takes place in non-digital sectors and therefore additional policy measures are required to enhance growth. Finally, a third paper by Bauer and Erixon (2016) also takes up this angle and puts forward the importance of competition-enhancing reforms in non-digital sectors as necessary to enhance potential growth from the increased use of ICT. In sum, each of these three works show the importance of digital investments and economic performance in Europe either directly or indirectly, but a supporting structure on how to think about this these issues has been to date somewhat missing. The papers are Van der Marel (2015), Hofheinz and Mandel (2015) and Bauer and Erixon (2016). In order to show the need for a framework, I will take the publication of Hofheinz and Mandel (2015) as a starting point, but modify their results a bit. Their paper provides a chart in which an indicator called “digital density” in 2010 (which is the within-country data traffic) is put in relation with intangible investments as a share of GDP in 2014. Intangible investments cover a wide spectrum of new types of investments that help to determine the competitiveness of an economy. Standard economics used to treat physical capital such as machines as the only type of existing capital. Then came a greater understanding of the role of human capital. Now there is also intangible capital which is seen as important for economic performance. Obviously, the two variables are strongly connected with each other as shown in Hofheinz and Mandel (2015): a greater level of investments in intangibles is associated with greater digital density. Figure 1 replicates their graph, but with a few alterations. First, it does not take the wider definition of intangibles into account but only one, namely “computerized information”. This is because computerized information is really at the core of digital investments, and much more so than other components of intangible capital. Computerized information covers both software and databases. Moreover, digital investments are really what is actually discussed in the two other publications that will be discussed below. Second, on a more technical note, rather than plotting the nominal value of investments I am using the corrected real value use of investment accumulated over the years, i.e. capital. Ultimately, what matters for economists is the amount of accumulated capital stock in an economy. This capital stock in Figure 1 also corrects for any depreciation over time and as such can only then be compared with other determinants of growth, or other factors of production such as traditional physical capital and human capital. Once this is done, it is possible to compare how well-endowed a country is with these factors and to determine whether a country has a comparative advantage or not. Third, the two axis are swapped: placing digital investments on the horizontal axis in the graph below implies that the amount of digital investments (or stocks in my case) determines the extent to which a country produces and makes use of data, not the other way around. It is true that the authors talk about correlations and not causation so that none of the factors actually has an effect on the other. The two items are indeed highly inter-linked, and one can debate if greater data production and usage of data (i.e. data density) stimulate greater investments in software – or if greater investments in software create a greater level of data density? Somehow, the way this relationship works remains yet unclear. However, in my view, and as pointed out in Christensen and Etro (2013), data can also be seen as a factor of production, next to the previously discussed intangible, physical and human capital. As with labour, generating higher skills in an economy comes on the heels of greater levels of investment in education. In such a scenario, a greater level of investments in software (per worker) in 2010 would generate greater data production and usage (per worker) four years later (i.e. 2014). Therefore, if anything, it would make more sense to plot our variables of data density on the vertical axis and investment in intangibles on the horizontal axis. If we follow such approach, what is the result? Figure 1 below shows the result for only six European countries (without the United States) because these are the overlapping countries for which two variables are available. Again, a clear correlation appears suggesting that software stock and data traffic are highly associated with each other. This was to be expected as both proxy for the same factor of production. However, some differences among countries do appear in this graph. 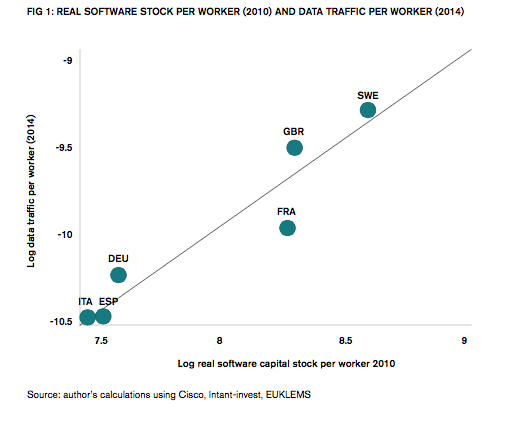 For one, countries such as Sweden and the United Kingdom, placed in the upper-right corner, show much higher data traffic and level of software capital stock than Spain, Italy or Germany, which are placed in the lower-left corner. The question is: should the latter group of countries be concerned with their position? Not necessarily. These differences could just as well point to different comparative advantages across European economies. By way of example, in the past Sweden made a lot of investment in computerized information, which has now translated into many economic activities using data, such as Spotify. Other countries have not made the same amount of investment and therefore Germany, Spain and Italy are just better at producing other things in their respective economies that use less data. Therefore, not all countries need to be equally endowed with “digital stock” and as a consequence not all countries need to be entirely specialized in providing services that use data. However, the differences across countries might become a problem if we think that the introduction of software and ICT serves as a “general purpose technology” in the wider economy and is associated with greater economic performance or simply economic growth. It is commonly accepted now that the extent to which ICT becomes embedded in other non-digital sectors is strongly associated with greater efficiency gains, and therefore economic performance across the wider non-digital economy. Based on such analysis, Figure 1 also tells us something else: some countries are doing better than others in terms of producing and using data compared to how these countries are endowed with ICT, or in our case software. Consider France, for instance. Based on its stock of software, it generates a lower than expected activity in data traffic (or data density) since France is placed below the trend line, which in this figure runs diagonally from the bottom left to the upper right corner. Similarly, Spain is also placed below the trend line indicating that even though it has low software stocks, it demonstrates even lower activities in data than what otherwise could be reasonably expected. Germany, UK, and Sweden on the other hand show greater levels of data density compared to what one could expect based on these countries’ respective accumulated software stocks. While the policy trend now is for everyone to jump on data indiscriminately, Figure 1 points to a more tailored policy conclusion. It is not so much an issue about Italy, Spain or Germany becoming like Sweden or the UK – whether policy should aim to “jump” from the bottom left corner up to the upper-right corner. A far more immediate issue is how, for instance, France and Spain can move up closer to the trend line that predicts how much a country “should” have activities in data based on its level of software stocks. In other words, the questions should not be why countries are lagging behind the best performer, but rather why countries are deviating from their own expected performance. Such question is an entirely different one and forms a more realistic framework for policy. It also points to another type of reform agenda, focused at exploiting comparative advantages rather than creating an endowment. This approach does not undermine the need for building up an endowment over the long term, but just like other forms of economic exchange, it is critically important for the economic contribution of digital capital that it is utilized efficiently because that, in turn, incentivizes investments. This framework also recognizes the country-specific context in which each European economy is placed as it points to factors within the country that could help explain why a country is not catching up. For instance, France is unable to get closer to the trend line as it lags behind in terms of data production relative to its accumulated level of software capital stock (or perhaps its larger intangible stock if one thinks this is a more appropriate measure). Therefore, there must be some factors within France that makes it that it is unable to come on equal path. What might explain these deviations from the trend line? And how do they relate to growth? This has been the focal point in the two recent publications and the answer points to the use of ICT in non-digital sectors. Bauer and Erixon (2016) argue that fragmented product market regulations prevents optimal resource allocation (i.e. competition) that could otherwise be improved through the increased use of ICT across the economy. Heterogeneity in regulations prevents ICT from entering into non-digital sectors thereby inhibiting any improvements of business models. Considering some of these product and services markets indicators, it is indeed the case that services regulations are still relatively high in Italy, Spain as well as in France across many sectors as measured by the OECD’s STRI index. Sweden and the UK on the other hand, have much lower restrictions in services, or just generally less regulatory interventions in product markets, so that competition may force additional use of ICT in non-digital sectors. A previous paper by me confirms this outcome by using a more formal analysis and relate this question to economic growth performance. In fact, that paper asks which specific policy measures may explain lower or higher productivity performance in non-digital sectors using precisely ICT. As it turns out, product market regulations in addition to other specific policy measures do indeed significantly matter in terms of generating efficiency gains through the use of computerized information in non-digital sectors varying from mining and agriculture to manufacturing industries and retail services. The question then becomes how software can then be best absorbed or embedded in other non-digital sectors. The specific policy measures taken up in this paper may therefore provide further answer next to the need of competition. For instance, it shows that next to product market regulations, employment protection, private credit provision and patent application open to non-residents as well as a high R&D expenditure are important factors in creating greater performance levels in non-digital sectors when making use of software investments. Put differently, in order to let software play its role as a growth enhancer, these specific policy measures should be simultaneously and sufficiently dealt with as the they go hand-in-hand. In more concrete terms, this means, for instance, that when looking at Figure 1, France’s location below the trend line may in fact be due to one of these domestic policy factors. Indeed, France still has high employment protection which may therefore provide one potential explanation why it is not catching up in terms of data density. On the other hand, Germany is placed above the trend line and although it also has high employment protection in place, it has an extremely high level of patent fillings by foreigners, which as we have seen is an important policy determinant for generating growth through ICT in non-digital sectors. Germany also has a slightly higher R&D expenditure than other countries. These specific policy measures plausibly explain why countries have lower or higher activity in data than expected. In addition, there may be another issue that these two studies have overlooked and which may explain the “over” and “under” performance of countries. Various studies have noticed entrepreneurial spirit to be an important determinant for software-intensive non-digital sectors such as design, business or financial services. This can probably be extended to other sectors in the economy as many smaller start-ups use a lot of computerized information, virtual databases and software to be competitive. Without ICT or software, a small entrepreneur cannot properly create value as its entire business model depends on it. Therefore, it is reasonable to expect that those countries in which it is easier to build a start-up and that have a high level of software investment also demonstrate greater performance in data-related activities. When checking the World Bank’s Doing Business database, it shows that among the 189 countries taken up in the sample, Sweden and the UK rank 16 and 18 respectively for the easiness to start up a business whereas, On the other hand, Germany is ranked 107. Italy ranks 50 and Spain is placed as number 82. Overall, there are many factors influencing the performance of an economy and ICT is only one of them. It is clear that investment in intangibles, and in particular the accumulated stock in software, is strongly associated with activities that produce, use and generate data. The two are interconnected and they could measure something very similar. Yet greater investments in software does not necessarily and directly have to lead to greater levels of data-related activities. Indeed, recent studies have shown that paradoxically this link is to a large extent dependent on the non-digital policies that are put in place by domestic governments. While some reforms regarding the single market for data or the digital single market come from Brussels, it is obvious that reforms to build a Digital Single Market need to be assisted by domestic reforms for big benefits to arrive. One task for the EU, however, is to share policy experience, give policy guidance, monitor progress or (or lack thereof), and create a culture of transparency for domestic reforms that are needed to benefit from the increased use of ICT. The European Commission is doing that in other areas. For instance, the EU has created a data base covering all regulatory barriers in professional services in each country. A similar database for all non-digital regulatory policy areas essential for the digital single market should be the next step. Bauer, M. and F. Erixon (2016) “Competition, Growth and Regulatory Heterogeneity in Europe’s Digital Economy”, Five Freedoms Project at ECIPE Working Paper No. 2, Brussels: ECIPE. Christensen, L. and F. Etro (2013) “Big Data, the Cloud and the EU Regulation on Data Protection”, Intereconomics, Vol. 48, Issue 5, pages 276-280. Hofheinz, P. and M. Mandel (2015) “Uncovering the Hidden Value of Digital Trade: Towards a 21st Century Agenda of Transatlantic Prosperity”, Lisbon Council / PPI institute, Issue 19. Van der Marel, E. (2015) “The Importance of Complementary Policy for ICT in the EU”, ECIPE Occasional Paper No. 8, Brussels: ECIPE.